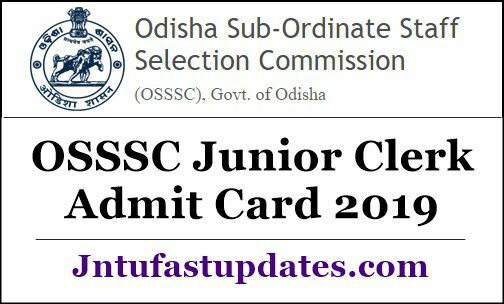 OSSSC Junior Clerk Admit Card 2019: Odisha Subordinate Staff Selection Commission (OSSSC) is going to conduct the Junior Clerk/assistant written test in few more days. All the applicants must have to increase their preparation as the competition is going to be tough this year. Candidates can download OSSSC Junior Clerk Hall Ticket/admit card 2019 from OSSSC official website, osssc.gov.in before proceeding to attend the examination. As the hall ticket/admit card is the most important document to attend the examination, all the applicants must have to download OSSSC Assistant hall ticket and preserve it safe to carry to the examination. The invigilators will not allow the candidates to the examination if they do not show the admit cards at the time of entering the examination. Hence all the competitors must aware of this and carry the admit cards as a must. To check the hall ticket availability dates, the downloading process, and more details, candidates can go through this article. Odisha Subordinate Staff Selection Commission (OSSSC) is the state government organization that releases various recruitment notifications every year. The OSSSC recently notified for 1746 Junior Clerk/Assistant posts. A large number of qualified candidates have applied for the announced during the application dates. The OSSSC will shortlist the candidates through the written test and interview rounds. Candidates have to qualify all the rounds to finally shortlist for the announced posts. All the applicants competing for the Junior Clerk/assistant posts in Odisha can download the hall tickets from the official website, osssc.gov.in. The admit card download link will be activated before 10 days of the examination [tentatively]. Soon after the hall ticket link available on the homepage, aspirants can download just by tapping on it. The hall ticket will contain the details of the exam center, date, timings, and other details. Search the OSSSC Junior Clerk Hall Ticket download link in organization website. Check the information in OSSSC Junior Clerk Hall Ticket 2019.